Our roots are in great food. We thought it would be fun to post from the kitchen today, though this recipe can easily be made while sitting on a picnic blanket or a porch swing. We also like to occasionally swap out the bagel for a Zingerman’s Paesano roll. Enjoy it in your favorite snacking spot, or even on the run. Here we are, from the pages of Zingerman’s Guide to Good Leading, Part 2: Being a Better Leader. This recipe joins 8 other bits of yum in the book. I’ve long loved this little sandwich. I’m exceedingly spoiled by—and biased towards—the handmade, no-vegetable-gum-added cream cheese we make at Zingerman’s Creamery, but you can certainly use a commercial product as well. 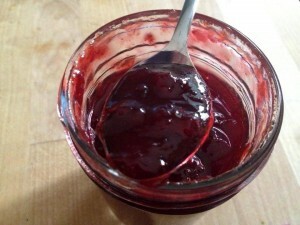 It’s great with figs and fig preserves, but any full-flavored fresh fruit and the matching preserves work well. Strawberries with strawberry preserves, blueberries with blueberry preserves, raspberries, peaches, plums . . . you name it—just pair pieces of the fresh fruit with preserves made from the same fruit, and you’ll be rocking! Spread each bagel half with 1 tablespoon cream cheese, then with 2 teaspoons preserves. Generously top each half with fresh fruit.